In 1989, the Beer Orders told British brewers they could either keep their breweries or keep their pubs, and far too many breweries decided to preserve their pubs and close their breweries. As a result, such famous breweries as Young’s, Bass, and Morland have closed. In Britain’s Lost Breweries and Beers, Chris Arnot, a former newspaper reporter who has also written a book on lost cricket grounds, profiles 30 British breweries that have merged or closed. It’s a nostalgic and charming look at a more-relaxed era where, as a former Mackeson’s employee notes, “a bloke named Sid” was always available should refreshment be required during the work day. For each profile, Arnot visits the site of the brewery, tells you which buildings still survive, and goes to the former brewery tap. He also interviews former employees, including, for his Boddington’s profile, the brewery’s last chairman, Ewart Boddington, who sold the company to Whitbread in 1989. Boddington improbably argues that “our beer is in every country in the world,” even though the Boddington Brewery, which survived the Luftwaffe, was torn down in 2004. Arnot answers many questions about old British beers. Why did Morland name its best-known beer “Old Speckled Hen”? Because the brewery was next door to an MG factory, and a car that ferried workers around the plant was so beat up and so flecked with paint that it became known as the “owld speckled ’un.” Old Speckled Hen was first brewed in 1979 to commemorate the 50th anniversary of the nearby MG plant. Arnot also reminds his readers of the significance of Thomas Hardy’s Ale, made by Eldridge Pope between 1969-99 and O’Hanlon’s from 2003-08. Because Thomas Hardy’s Ale aged for a year to obtain 13 percent ABV, it was sold for a pound a pint—at a time when the typical bitter sold for 10 pence a pint. Thomas Hardy’s was so expensive that most pubs would not sell more than a “nip” (a third of a pint) at a time. The best news in Arnot’s book is that a new generation is attempting to revive long-dormant brands. Joule’s closed in 1974; its staff marked the occasion by filling the fermenting vessels with water and swimming in them. In 2009 former Bass executive Steve Nuttall bought the rights to the name and is brewing Joule’s beers 11 miles from where the brewery used to be. Also on its way back is Truman’s, a brewery so old and so large that Charles Dickens mentioned it in David Copperfield. In 2010, James Morgan and Michael-George Hemus bought the rights to Truman’s and are currently making it under contract at Everards. 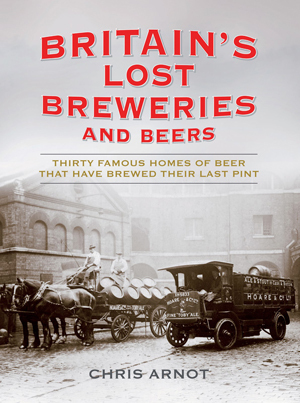 Readers who like well-written books on brewery history filled with rare photos will thoroughly enjoy Britain’s Lost Breweries and Beers.